Announcing The Fifth Feature Length Original PG-13 Animated Film from Warner Brothers and DC Comics: Following Such Smash Successes as Wonder Woman, Batman: Gotham Knight, and Superman Doomsday. Hits Shelves on July 28, 2009. "The fabric of intergalactic justice is threatened – until Hal Jordan arrives for his initial mission – in the animated Green Lantern: First Flight, the fifth entry in the popular DVD series of DC Universe Animated Original PG-13 Movies. A co-production of Warner Premiere, DC Comics and Warner Bros. Animation, the illuminated hero’s first-ever full-length animated film is set for release by Warner Home Video on July 28, 2009. Green Lantern: First Flight will be available as a special edition 2-disc version on DVD and Blu-Ray™ Hi-Def . "Acclaimed actor Christopher Meloni (Law & Order: Special Victims Unit) fills the lead voice of Hal Jordan aka Green Lantern. Meloni is joined by fellow Emmy Award nominee Victor Garber (Milk, Titanic) as the villainous Sinestro, Tricia Helfer (Battlestar Galactica) as the voice of Boodikka, and Michael Madsen (Reservoir Dogs) as Kilowog. 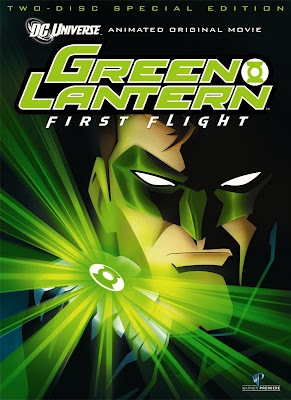 "Produced by animation legend Bruce Timm, Green Lantern: First Flight is helmed by heralded director Lauren Montgomery (Wonder Woman, Superman Doomsday) and scripted by four-time Emmy Award-winning writer Alan Burnett (The Batman). "Green Lantern: First Flight finds Hal Jordan recruited to join the Green Lantern Corps and placed under the supervision of respected senior Lantern Sinestro. The earthling soon discovers his mentor is actually the central figure in a secret conspiracy that threatens the philosophies, traditions and hierarchy of the entire Green Lantern Corps. Hal must quickly hone his newfound powers and combat the treasonous Lanterns within the ranks to maintain order in the universe. "Green Lantern: First Flight Blu-Ray versions will include all the great extras as the 2-disc Special Edition as well as an additional two episodes of Justice League picked by Bruce Timm. "Apart from this animated release, Warner Bros. Pictures is currently in pre-production on a new “Green Lantern” theatrical motion picture, to be directed by Martin Campbell, bringing the popular DC Comics super hero to the big screen for the first time."